John Peterson can barely contain his excitement. His plan to transform the former Tila’s into a new location of The Rice Box is almost complete. Yes, the rumors are true. The food truck-turned-restaurant that bills itself as “Chinese takeout from the future” will soon add a third sibling (at 1111 S. Shepherd Dr.) to its outposts in Greenway Plaza and The Heights. Peterson has avoided speaking publicly about the project throughout the 15 months of construction, but this week’s installation of the restaurant's signature red-and-blue neon sign served as confirmation and prompted him to offer a brief sneak peek at the space. Save for some neon lights and other interior details, the work is almost complete (but unfortunately not ready for photos). If all goes according to plan, the restaurant will open in approximately 30 days (April 1, give or take a few days). “This is the most you can possibly do to a building without completely tearing it down,” Peterson tells CultureMap as he leads a tour of the building. 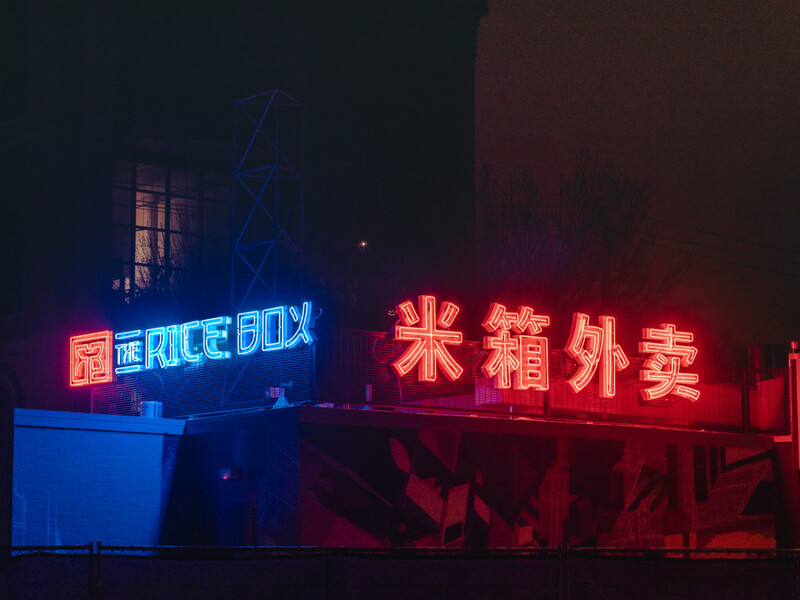 Once again, he tasked local design firm Collaborative Projects (UB Preserv, Georgia James) with capturing the right Blade Runner/Aliens vibe that defines The Rice Box’s signature look. All told, the restaurant will seat about 35 inside, which is three times larger than the Heights location. An outdoor patio — complete with custom sunshade and oversized, industrial-style fans — will hold another 20 or so. The new location’s larger footprint also means a bigger kitchen, which starts with eight wok stations (Greenway has three). Additional capacity means new dishes — Peterson hints that orange peel beef will be one new addition — as well as whole new categories such as soups and desserts. He’s even purchased the equipment to make the sort of steamed noodle dishes that are common at dim sum. Needless to say, The Rice Box has come a long way from its food truck roots when cooks operated with a griddle and used creative sauces to capture that signature wok flavor for the truck’s five dishes. Now, the menu covers multiple proteins, and its beef comes from Texas purveyor 44 Farms. He works with his fiancee, Jenny Vo, to manage the restaurants, develop new dishes, and keep everything working smoothly. Growth has also allowed Peterson to cook the dishes in a more traditional way, paying homage to the family-owned American-style Chinese restaurants who developed the recipes and techniques that inspired his menu. Opening on the border of Montrose and River Oaks has Peterson feeling a little emotional. It brings him as close as he’s been to his roots operating a truck from parking lots in Montrose; something the Rice Box hasn't done since the Heights location opened two years ago. “The fact that I’ve been given the opportunity to bring my vision to this block in River Oaks. I mean, this is the first or last thing you see when you’re entering or leaving River Oaks,” he says “Not only that, we’re right across the street from Hugo Ortega [at Backstreet Cafe]. I haven’t even met him yet, which is crazy. I’m a little shy. That guy is big time. Of course, Peterson is already thinking about his next location. He’d like to stay inside the loop. The truck used to host “Ricer Wednesdays” when dozens of people in highly modified, mostly Japanese cars would turn lower Westheimer into an impromptu car show. Ideally, the next location would allow him the opportunity to tie together those elements of cars and street culture with a love for Chinese food, tea, and beer. But that’s still a little ways away. For now, he’s getting ready to introduce The Rice Box to River Oaks. Maybe someday soon Hugo Ortega will stop by for some General Tso’s chicken and a fortune cookie.